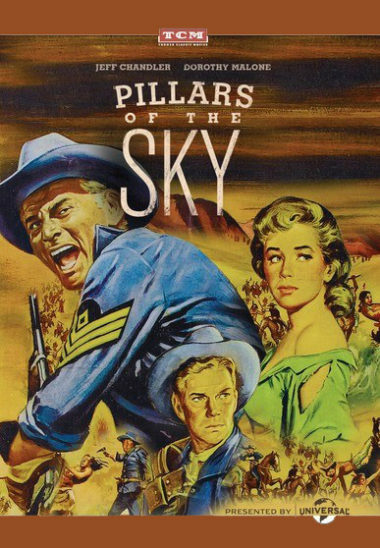 Pillars of the Sky – First Sergeant Emmett Bell (Jeff Chandler) faces off with Apache chieftain Kamiakin (Michael Ansara) in this nuanced portrayal of racial tensions between Indians and settlers in 1860s Oregon Country. Bell must lead his men and civilian charges (including Dorothy Malone and Ward Bond) on a mad dash to federal sanctuary. Directed by George Marshall (Destry Rides Again, How the West Was Won), this tale of frontier survival is truly an action thriller set against widescreen western horizons. All star cast: Jeff Chandler, Dorothy Malone, Ward Bond, Lee Marvin.